A great night in Hobart at the Grand Chancellor Hotel for the Heart Foundation Tasmania Annual Fund Raising Cocktail Party, in the presence of the Governor Professor Kate Warner and her husband Richard Warner. 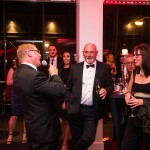 Hosted by local celebrity John X the evening raised over $50,000.00. The auction included some terrific local art, outdoor adventures and luxury holidays. We heard from Lauren Watson who has suffered from heart failure since a baby. Now a mum after an emergency caesarean to save both her and her baby as her heart failed again. She is living a full life and is about to embark on a huge trek in Tasmania too not only strengthen her heart but to raise further funds for the Heart Foundation. The crowd responded well to Lauren\‘s story and supported the pledge that I ran after the auction. Thank you to the team and Edwards Windsor who made it possible for me to attend.